Inscription: Lettered below the image Our Saviour and the Woman of Samaria / From the orignal picture at Wilton House in the collection of the Earl of Pembroke to whom this Plate is respectfully inscribed / by His Lordship's oblig'd and obed't servt John Dean, and Painted by Giuseppe Chiari / Engraved by Jno. Dean / Publish'd Jany. 31st. 1786, by J. Dean, No. 12, Bentinck Street, Soho. Christ is seated on the left, at the edge of a well, pointing up to the left and gesturing with his other hand towards a pitcher of water on the step leading up to the well. 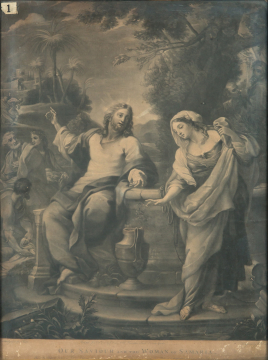 He is looking towards the woman of Samaria, on the right, who is reaching down to the pitcher. Other figures can be seen in the background on the left and there is a town in the distance.